In the first ADALife Blog post of the semester we hear from Erika (one year physical theatre student), Kayleigh (dance student) and Mose and Georgie (semester physical theatre students) after finishing one week of their semester. After a month and a half of traveling the world, there was nothing quite like returning to the yellow walls of Villa Godiola for the start of a new term. Last semester changed my life; I learned how to live as an individual in a community of endless support and creativity. I learned that alone time is sacred, especially in a place where it is scarce. Maybe most importantly, I learned that I am an artist, and I have a lot that I want to say. The energy in the villa is fresh but familiar. The majority of students have just arrived for the first time, eager to discover magic in our studios and wisdom in our professors. Seven of us are returning; we’ve labeled ourselves the yearlongs, the Seven Dwarfs, a multi-celled organism, an ensemble, a family. There’s a lot of pressure we’re putting on ourselves to make this semester count without driving each other absolutely insane—although even the best families have their moments of insanity. I’m ready to work. I’m ready to write everything down because I refuse to forget it. This is the beginning of the end of the year that changed my life. I’m going to make it count. I’m going to remember it forever. I arrived at the Accademia largely by chance. A friend of mine in the circus community mentioned in passing that he would be attending ADA for the ‘18-19’ academic year and I, not having study abroad plans yet, decided to check it out. Growing up in circus, I had always wanted to study clowning and physical theater in more depth. In school as a dance major who has never taken ballet, I wasn’t inspired by the study away dance programs offered at my school. Not knowing where to turn, I applied to the ADA physical theater program and miraculously got in. Even crazier–I went. Now here I am, in a beautiful villa atop a hill near the quaint town of Arezzo. We just finished our first week of classes; with everyone, my ambiguity and insecurities started to fade and my conviction in my purpose here strengthened and clarified. No I am not a theater major, as I had to keep explaining to teachers class after class. But as an avid mover, this material makes complete sense to me–in my vision of myself as an artist and who I want to become. I can feel myself ferociously needing to consume it and transform. 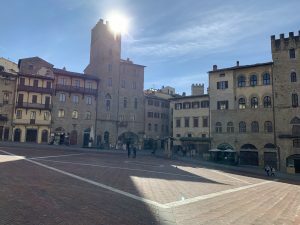 Yes, Arezzo is astonishingly beautiful and rich with history and, yes, they have the best gelato and 1€ shots and, yes, getting lost in the city is like falling into a dream. But, I feel like yelling to my home school of Oberlin–”HEY YOU CRAZY CONTACT-DRIVEN EXPERIMENTAL DANCERS–Y’ALL NEED TO CHECK THIS PLACE OUT. LET’S MAKE ART!! !” And indeed I will travel back at some point and say exactly this. But in the meantime, I’m vibrating with the nervous, excited energy of challenge and growth. This risk of mine has proven successful thus far, and so I am looking forward to many more trekking forward. 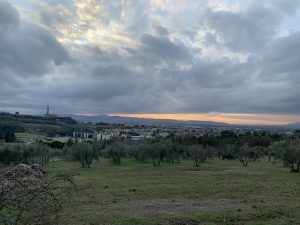 In the first seven days I have spent at ADA, there has not been much that isn’t new to me: Europe, jet lag, names and faces, set mealtimes, the Italian language, and sweeping vista views, to name a few. However, perhaps what has stuck out most is the last thing I was expecting to adjust to: being sore. Although I’d say I’m a pretty active individual, nothing could prepare me for the wave of soreness I felt waking up after our first full day of classes. My body felt like it had been chopped up into little pieces, placed into a washing machine, then spun around for three and a half hours on high power. I may be exaggerating a little, but I was certainly wasn’t ready for my body to feel that way this early. For a long time, I always looked at soreness as an indicator of inability, a sign that I lacked strength to do what was being asked of me. Only recently have I started to alter this mindset, looking at soreness as a sign that my body is properly reacting to the challenges at hand. In fact, living life without soreness (literally or metaphorically) feels more and more like a kind of complacency. Soreness is a sign of change, challenge, and all the good things that come with it, and I am grateful knowing that ADA is going to make me stronger in every way. So the next time that familiar sore feeling shows up (and it will), I’ll be waiting for it with a big ol’ grin. The first week was a tornado of information, new sights, and new experiences. Beginning with orientation, Monica threw us right into Italy with an Italian hand gesture lesson and a tour of Arezzo on the second day. Over the weekend we got another chance to explore the beautiful city. During the day many of us went into the city for lunch and to explore on our own. We shopped and meandered around, taking in the beauty of something so old. It is shocking that these buildings stood for thousands of years, when the ones in Philadelphia are only a few hundred at best. In the evening we went out for dinner and wandered into Bar My Way, where we could each get our favorite cocktail. Sunday was a lazier day, wandering into town for lunch and taking it at more of a slow speed. One friend and I went to a part of town we had never seen and lollygagged down the residential streets. We found lunch at Coffee O’Clock where we also had hot chocolate as thick at mousse. The evening was spent at the Villa, meeting with friends to make travel plans for the weeks to come.